The Sixers will return to this half-court logo for the playoffs. With the Sixers heading to the NBA Playoffs for the second year in a row, it's time for the team to unveil their playoff slogan for the 2019 season. And it's going to look familiar. Last year, the Sixers rolled out a playoff campaign, "Phila Unite," that caught the attention of not just the local fans, but fans nationally and internationally as well. You likely remember it, even though you haven't seen much of it since the team was eliminated by Boston in the second round last postseason — and if you're a Sixers fan, you likely own at least one piece of apparel with the severed snake and Liberty Bell logo. Hey — if it ain't broke, don't fix it. The campaign was wildly successful in Year 1, and it's coming back for a second season. And the return, according to Sixers, has always been part of the plan, and isn't just a reaction to them outselling every other team in playoff merchandise last year. "It's been four years since we started working on the concept and last year was the big unveiling," Sixers president Chris Heck said while sitting in the bowels of the Wells Fargo Center during a recent game. "So we've planned this for three years in advance. The thought was, teams do playoff themes and they may have a slogan or something like that. And it's nice, you can put it on a t-shirt — that's all good. I think some teams do a good job with that, but our thought was, as we were building this brand up, can we really give it a punch? And the one theme which started off in the playoffs and has now morphed into something that's year-round is the Toronto Raptors with 'We The North.' So we just started digging in a little bit, and we said we can do something, and if we really focus on this, the 'punch' can come back every year, but we have to be so disciplined with it." In a way, "Phila Unite" is a bit like the McRib — it re-appears on the menu, people go crazy and buy so many that they actually drive the price pork up, and then it disappears into the night like Keyser Soze. At least, that's the idea. "Well, we wanted to hit it hard a week before the playoffs, and then when our season was officially over, we'd take it all down immediately," Heck added. "That was the focus last year, even though you're sad to be done and everything else, we had to focus on taking it down. Shutting it down and taking [everything] down was almost as hard as starting it up. So there's a real discipline in it and we think we have made a movement that has never been seen in the NBA before last year, with 'Phila Unite' and all the stories that go behind it." 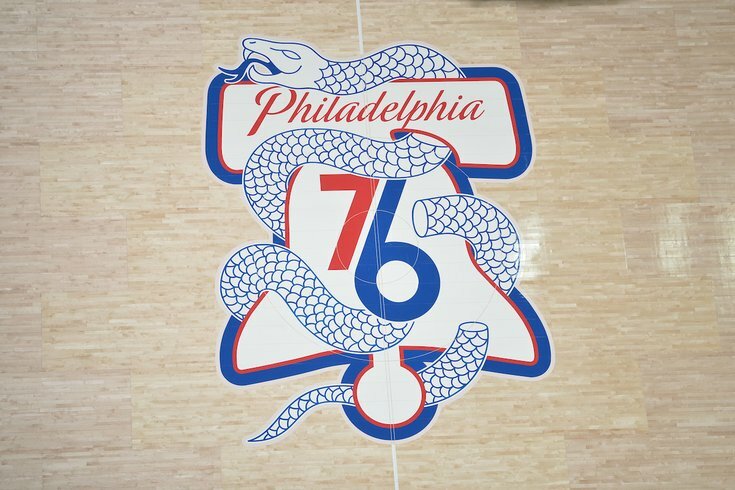 And there are a ton of stories behind it, from the original meaning of the severed snake, how the campaign took over the city for a brief time last year, and how the Sixers are safeguarding against overusing the logo. For example, the NBA wanted the Sixers to put the severed snake logo on a uniform for this season, but the team said they would only do that if those uniforms could be saved and used exclusively in the postseason. The NBA said no, so the Sixers passed. "We want to build a movement that we continue to build that equity in that transcends time," said Sixers Chief Marketing Officer Katie O'Reilly. "We think this can be the rallying cry for the city, for our fans around the world for playoffs for years to come. And that's really the goal here. So, can we continue to sort of ring the bell, if you will, and make folks aware and really have the discipline to keep it special and unique to the playoffs." The Sixers may have hit a home run with their first playoff campaign, but it wasn't luck. This was a carefully coordinated process (I use that word with intent) that has been in motion for years. For proof, just look at the severed snake that was stitched into the uniforms two years before the team made the playoffs. That's because when you talk to anyone inside the Sixers organization, this has always been the plan. And the down years in the middle of "The Process" allowed the Sixers marketing team the latitude to build and prepare for the playoff runs they always new would come. "When everyone talks about 'The Process' and everyone's like, 'Oh, it must've been so hard [for you guys].' Not really, because we knew what we were doing," Heck said. "We knew what the expectations would be out there in the basketball world, and then of course fandom, but we also knew that there was a timeline... And I think that the real story of 'The Process' to us is — of course it's what happened with the roster and the results and then eventually this team that is super special, but it also was a chance for us to rebuild the business side and the brand itself. "We call it our five-year overnight success," O'Reilly added. "So I think while the world and Philadelphia might have seen us during 'The Process,' we knew. We had been planning and we really believed in that. Would we have been ready [with the snake logo] the year before? Probably not, but we really believed [last season] was the year we would hit it. So, we rolled the dice a little with the uniforms and things, but I think for us, nothing was a surprise. Chris, Scott [O'Neil], myself, a lot of us, our first year was the same as Brett [Brown]. So we've all kind of been on this road together from the beginning, and I think we knew to bank on that season." For both the basketball and business sides, the Process is in its final stage. For Heck, on the business side, that stage is about bringing some stability to the Sixers' brand, both locally and globally. And to the Sixers, thinking globally is not just something nice for them to put in marketing materials. It's why they take the team to China and Europe. It's why they have a huge following in Australia — and a sponsorship deal with an Australian meat pie company. But even still, there's a large segment of the world who has no idea why the 76ers are called the 76ers. As Heck pointed out, when the team travels abroad, fans overseas don't know what the logo they're wearing represents. But that hasn't stopped them from embracing the logo nonetheless, especially the team's playoff logo, which was spotted in Australia last summer — as a 50-foot wall mural. And if that mural caused a few Australians to go learn a little about the history of Philadelphia, that's pretty cool too. 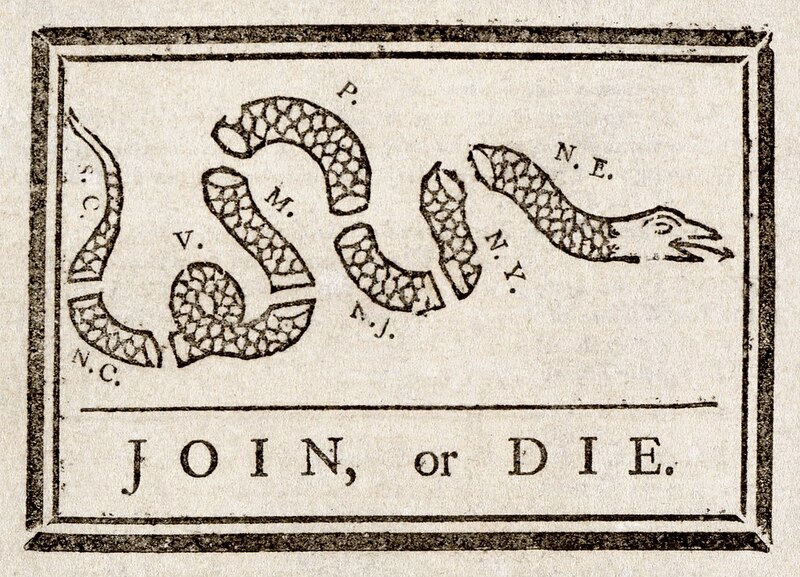 The real star of the "Phila Unite" logo is the severed snake, an homage to Benjamin Franklin's "Join or Die" cartoon from the Pennsylvania Gazette in 1754. The severed snake represents each of the colonies. The message, clearly, is that when the snake is whole, it is strong, but when it is split, it will wither and die. So how did the Sixers come up with the idea to incorporate this somewhat obscure historical reference into their logo? Let's just say Paul Giamatti played a small role. Back when they were coming up with the idea for the logo, Heck and O'Reilly happened to both recently have watched the HBO miniseries John Adams. And in case you haven't seen it, the intro goes a little something like this. From there, they put the Sixers marketing team to work, and they dug in on the history to learn more about this logo and what it represented. "It gave us a chance to be authentic, to be cool without trying to be cool, and to give ourselves an icon that was not numerical," Heck said. "Then, the deeper meaning of it when we started doing the research and understanding what Ben Franklin meant by this cartoon of the severed snake, with each of the colonies having their own agenda and maybe not being in sync with each other. But if they were in sync, they could be deadly. And that was the idea. "Katie said it right out of the gates, that's Philadelphia, that's the neighborhoods of Philadelphia. And so we absolutely knew we struck gold when we saw that Paul Giamatti gem." "And it's so on-brand," O'Reilly added. "Everything we do is incredibly authentic and we're storytellers, so we like being able to bring that history to life. And we feel a responsibility — the brand, the 76ers, it's such a powerful brand that has this incredible story. Every time we bring it to life in a different way, we want to make sure it's authentic to the city, to our fans, and to us. It was really perfect." Now, the mission continues, as the "Phila Unite" logo makes its return to not only the court at the Wells Fargo Center, but all over the city as well ... if only for the time being. "But that was the idea, ultimately, that we could put [the logo] away and now we bring it out and it's new again," Heck said. "I think that's where we differentiate ourselves from 'We The North.' They loved it so much that they wanted to use it all the time, and that's great for them, but for us, we want something that is going to punch you in the side of the head every single year when it's time to be a sports fan again in Philadelphia." So will there be any changes to the logo for this year? "No. It's about discipline now," Heck added. "Let's stay true to it and drive it. I don't see that day when we go away from it. I think it represents 'The Process,' quite frankly, and it never ends. That's the hope."